We stand corrected on ບູຮານ and ໃນປະຈຸບັນນີ້. Thanks. As for the other ways of saying "a long time ago", these are all great suggestions, thank you for mentioning them. 0ur visitors will get to see the different ways of saying that. Though ຕອນແຕ່ກີ້ is the more simpler and commonly used one. I concur with long time ago definition- ຕອນແຕ່ກີ້ (dton tae gee) for simpler version. 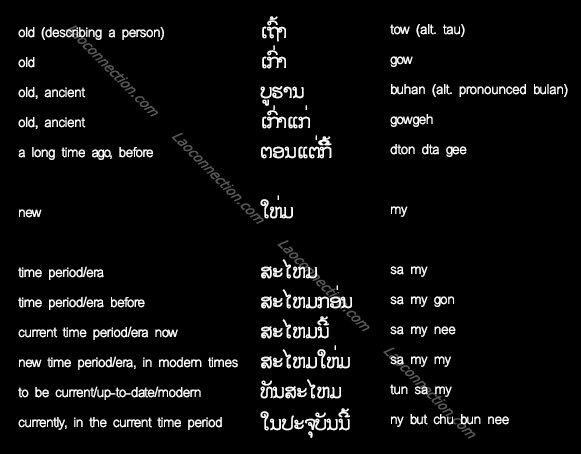 To make it shorter, I also use ແຕ່ກີ້ (dtae gee). This is very helpful website about Laos. Very informative. Kob jai lai lai der.